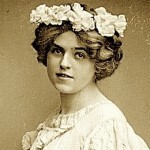 A close reading of the following list can provide a kind of mini Lehmann biography: small roles at the beginning of her career, the rather precipitous growth to larger, more demanding characters as well as the many roles in forgotten operas which every opera house must try out. If you want a day by day chronicle then check out the Chronology. This list below doesn’t always show the number of performances of each role (except in Vienna) or how the roles were assumed in other houses, especially in the US. It also overlooks the roles which she prepared but never performed in their entirety, for instance, Isolde. 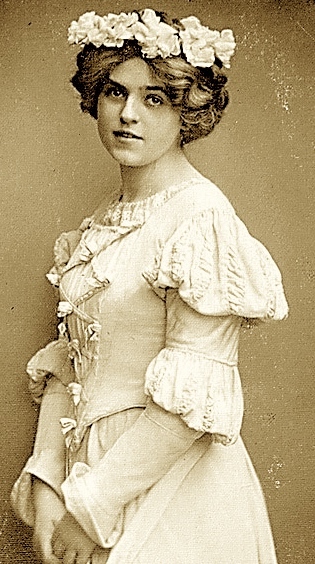 Isolated arias such as “Ozean, du Ungeheuer” from Weber’s Oberon; “Reich mir die Hand mein Leben” (La ci darem la mano) (Zerlina’s duet with Don Giovanni) and others which she recorded but never performed on stage, are not represented on this list. You can find isolated arias mixed in with the Lieder below the Opera list. Lehmann’s fame mistakenly often rests on a few Wagner and Strauss roles. This stereotype does great injustice to the breadth of interpretations she essayed. The total number of roles performed on stage is an incredible 93. And the total number of performances 1,613! This last number was gleaned from the appendices of Alan Jefferson’s Lehmann biography. Lehmann’s final opera appearance was with the San Francisco Opera in Los Angeles as the Marschallin in 1946. Compiled by André Tubeuf with help from me. d’Albert: Tiefland: Pepa, 12/13 H (Hamburg 3); Marta, 20/21 V (Hamburg & Vienna 3); Die Toten Augen: Myrtocle, 15/16 H (Hamburg 13+7 as guest) also with the Prague Opera and Charlottenburg Berlin. Beethoven: Fidelio: Leonore, 26/27 V; (Vienna 35) (other performances in Salzburg, Hamburg [as guest], Berlin, Paris [with the Vienna Opera on tour], Stockholm [with the Vienna Opera on tour], Antwerp, & London) for a grand total of 82! Bittner: Der Musikant: Friederike, 18/19 V; (Vienna 6); Die Kohlhaymmerin: Helene, 21/21 V; (Vienna 2). Bizet: Carmen: Micaela, 11/12 H; (Hamburg 29); (Vienna 17). Blech: Versiegelt: Else, 12/13 H; (Hamburg 3). Brandt-Buys: Die Schneider von Schonau: Veronika, 16/17 V; (Vienna 4). Branfels: Don Gil: Juana, 24/25 V; (Vienna 3). Cornelius: Der Barbier von Bagdad: Margiana, 14/15 H; (Hamburg 5); (Vienna 10). Gluck: Orphée ed Eurydice: Eurydice, 11/12 H; (Hamburg 3) Iphigenie en Aulide: Iphigenie, 13/14 H (Hamburg 3). Goetz: Der Widerspenstigen Zähmung: Katherine, 27/28 V; (Vienna 3); Lehmann sang Katherine’s famous aria many times in concerts and recitals all over the world. Goldmark: Das Heimchen am Herd: May, 11/12 H; (Hamburg 4). Gounod: Faust: Marguerite, 16/17 V; (Vienna 24) also guest performances in Breslau, etc. Heuberger: Opernball: Angele, 14/15 H; (Hamburg 10); (Vienna 3). Humperdinck: Hansel und Gretel: Sandmännchen, 10/11 H; (Hamburg 9); Taumännchen, 11/12 H (Hamburg 1). Kaiser: Theodor Körner: Christine, 14/15 H; (Hamburg 5). Kienzl: Der Evangelimann: Martha, 12/13 H; (Hamburg 17); Der Kuhreigen: Blanchefleur, 21/22 V (Vienna 3). Korngold: Der Ring des Polycrates: Laura, 18/19 V; (Vienna 2); Die Tote Stadt: Marietta/Marie, 24/25 V; (Vienna 3), Berlin, etc. ; Das Wunder der Heliane: Heliane, 27/28 V; (Vienna 7, also Hamburg 2, as guest). Mascagni: Cavalleria Rusticana: Lola, 10/11 H (Hamburg 2). Massenet: Manon: Manon, 16/17 V; (Vienna 60); Werther: Charlotte, 17/18 V; (Vienna 16). Meyerbeer: Le Prophete: Choirboy, 10/11 H (Hamburg 7). Mozart: Die Zauberflöte: Second Boy, 10/11 H; First Boy, 11/12 H; Pamina, 13/14 H; (Hamburg 9); (Vienna 20); Cosi fan tutte: Dorabella, 12/13 H (Hamburg 9), Covent Garden, etc. ; Marriage of Figaro: Countess, 13/14 H; (Hamburg 16) (Vienna 6), Covent Garden, etc. ; Lehmann also sang arias of Cherubino in concerts; Don Giovanni: Elvira, 26 L; (London 3). Nicolai: Die Lustigen Weiber von Windsor: Anna, 10/11 H; Frau Fluth, 16/17 V; (Vienna 9). Offenbach: Fortunios Lied: Max, 10/11 H; (Hamburg 5); Hoffmanns Erzählungen: Antonia, 12/13 H, (Hamburg 21) (Vienna 15); Giolietta, 16/17 V, (Vienna 1); Orpheus in the Underworld: Eurydice, 13/14 H, (Hamburg 12). Pfitzner: Palestrina: Silla, 18/19 V; (Vienna 6). Puccini: La bohème: Mimi, 19/20 V; (Vienna 37); also Hamburg [as guest], Berlin, Dresden); Madama Butterfly: Butterfly, 20/21 V; (Vienna 24) (also Hamburg [as guest], Berlin, Prague, San Francisco); Suor Angelica: Angelica, 20/21 V; (Vienna 13); Tosca: Tosca, 22/23 V; (Vienna 15; Hamburg [as guest]; San Francisco; Metropolitan); Manon Lescaut: Manon, 23/24 V; (Vienna 7); Turandot: Turandot, 26/27 V; (Vienna 12), also Berlin 3 or 4, Breslau, Hamburg [as guest] 2); Il Tabarro: Giorgetta, 31/32 V; (Vienna 4). J. Strauss Jr.: Der Zigeunerbaron: Irma, 10/11 H (Hamburg 4); Die Fledermaus: Orlovsky, 14/15 H, (Hamburg 8); Rosalinde, 30 L (London 7); (Vienna 1). R. Strauss: Der Rosenkavalier: Sophie, 10/11 H (Hamburg 19) (London 2) (Leipzig 1); Octavian, 14/15 H (Hamburg 14); (Vienna 12); Marschallin, 24 L (London 24); (Vienna 47) (Salzburg 18) and Hamburg as guest, Paris, Berlin, Philadelphia, Cleveland, Chicago, San Francisco 9, and the Metropolitan 34; Ariadne auf Naxos: Echo, 12/13 H (Hamburg 8); (This was the opera in its first version); Komponist, 16/17 V, (Vienna 38); Ariadne, 22/23 V; (Vienna 25); Die Frau ohne Schatten: Färberin, 19/20 V; (Vienna 11); Intermezzo: Christine, 24 D (Dresden 4); (Vienna 14); Arabella: Arabella, 33/34 V; (Vienna 5). Tchaikovsky: Queen of Spades: Lisa, 18/19 V; (Vienna 14), Berlin etc. ; Eugen Onegin: Tatiana, 33/34 V; (Vienna 11); (many times in Berlin). Thomas: Mignon: Mignon, 16/17 V; (Vienna 18). Verdi: Otello: Desdemona, 22/23 V; (Vienna 16) (also in London 3, Dresden, Berlin, and Budapest). Wagner: Tannhäuser: Second Page, 10/11 H; First Page, 10/11 H; Shepherd, 12/13 H; Elisabeth, 14/15 H (Hamburg 5), (Vienna 40); Das Rheingold: Freia, 10/11 H (Hamburg 20); (Vienna 3); Wellgunde, 12/13 H (Hamburg 6); (Vienna 1); Die Meistersinger: Apprentice, 10/11 H; Eva, 13/14 H (Hamburg 12); (Vienna 54); Lohengrin: First Squire, 10/11 H; Elsa, 12/13 H (Hamburg 28); (Vienna 39); Rienzi: 2nd Messenger of Peace, 11/12 H; Irene, 12/13 H; Die Walküre: Ortlinde, 12/13 H; Gertlinde, 12/13 H; Sieglinde, 13/14 H (Hamburg 8); (Vienna 32); Parsifal: 4th Flower Maiden, 13/14 H; 5th Flower Maiden, 14/15 H; (Vienna 7); Götterdämmerung: Gutrune, 13/14 H (Hamburg 13); (Vienna 8) (also on tour in South America); 3rd Norn, 13/14 H; Wellgunde, 16/17 H.
Weber: Der Freischütz: First Bridesmaid, 10/11 H; Agathe, 11/12 H (Hamburg 32); (Vienna 18); Oberon: Meermädchen, 12/13 H (Hamburg 6); Lehmann sang the aria “Ozean, du Ungeheuer” as a concert piece throughout her career. Weingartner: Kain und Abel: Ada, 14/15 H.
Wolf-Ferrari: Jewels of the Madonna: Second Girl, 11/12 H; Stella, 12/13 H.
Zaiczek-Blankenau: Ferdinand und Luise: Luise, 17/18 V; (Vienna 6). You can hear her famous interpretations of Winterreise which was her favorite song cycle. Here are the songs that Lehmann sang, as well as arias that she used in concerts. Liederkreis Opus 39 (song cycle). This includes songs performed separately: In der Fremde, Waldesgespräch, Frühlingsnacht, etc. In 1946 and 1947 Lehmann sang the following songs in recital throughout the United States. The songs are in alphabetical order by composer. There are many non-German songs, which one expects so soon after the war. 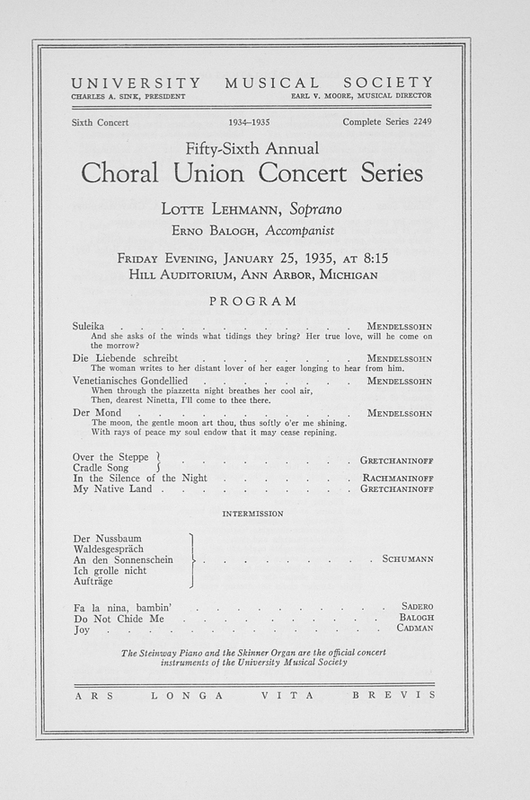 Lehmann listed in her repertoire booklet but didn’t sing: Alban Berg’s Im Zimmer and Die Nachtigall.